For the best Volkswagen service, you can count on us at Fredericton Volkswagen! When the time comes to maintain your Volkswagen vehicle, trust the experts at Fredericton Volkswagen. We have a wide range of services, including mechanical and detailing maintenance, Volkswagen Original Parts and accessories, and a Tire Centre with tire storage. At Fredericton Volkswagen, we can repair and maintain any vehicle make ― not just Volkswagen products. We not only offer all the services you are looking for under one roof, but we also try to exceed your customer service expectations at every visit! At Fredericton Volkswagen, you come first, and each of our customers receives personalized and dedicated service. 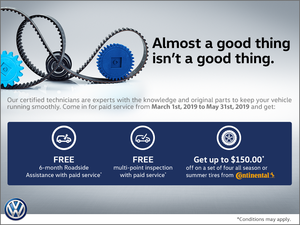 Come and discover all our services today at Fredericton Volkswagen! No matter which part or accessory you are looking for, we have it at Fredericton Volkswagen! Our team of experts will be able to help you find the part or accessory that will perfectly meet your needs ― we can even install it on site. No matter what your needs are, there is a Volkswagen Original Part or accessory that can meet them. Discover our extensive collection of roof boxes, bicycle racks, summer and winter tires, and much more today at Fredericton Volkswagen. Made in Germany, our parts are built to last and come with a 2 year / Unlimited km limited warranty. At Fredericton Volkswagen, you will get the best service when you bring in your Volkswagen vehicle for maintenance or repairs. From simple oil changes to preventive maintenance and complex repairs, we are able to help you at Fredericton Volkswagen. Regardless of which vehicle you have, if you want to ensure its reliability, safety and durability, trust Fredericton Volkswagen. If you want to prepare your car for spring or clean it thoroughly just in time for summer, you can trust the Fredericton Volkswagen team of detailing experts. We use only high-quality products and state-of-the-art tools to perform our services. Whether it's to refurbish your car, maintain and protect its bodywork, or clean its carpets and car seats, come today to Fredericton Volkswagen.